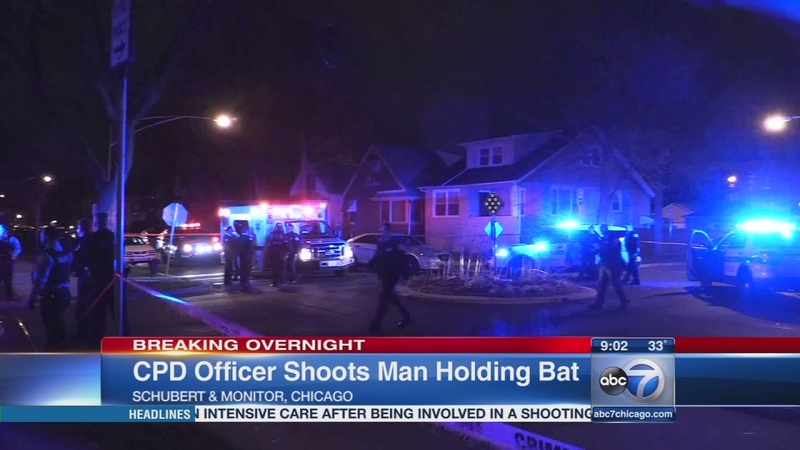 CHICAGO (WLS) -- A man and a teenager have been charged after an off-duty Chicago police officer shot the man, who police say hit the officer with a bat Saturday night in the Belmont Cragin neighborhood on the Northwest Side. The 37-year-old off-duty officer was walking in the neighborhood at about 10:30 p.m. when he came across an "aggressive male subject" holding his waistband, according to Chicago police. The officer announced himself and started to pat him down when the teen called out to family members. At that time, police say 32-year-old Anthony Castaneda came out of a residence armed with a baseball bat. Police said the officer identified himself again, but Castaneda approached and hit the officer multiple times with the bat. The officer, who is assigned to the Town Hall District, drew his gun and fired shots at Castaneda, striking him in the abdomen, police said. Castaneda is charged with aggravated battery of a police officer and aggravated battery with a deadly weapon. TCastaneda was taken to Advocate Illinois Masonic Medical Center in critical condition, according to Chicago Fire Department Cmdr. Walter Schroeder. The officer suffered an injury to his arm and was taken to Northwestern Memorial Hospital, where he was treated and released. The teenager the officer initially approached was charged with misdemeanor counts of aggravated battery of a peace officer and cannabis possession. More than a dozen members of the Chicago Police Department could be seen investigating outside a two-story apartment building at the corner of Schubert and Monitor early Sunday. The intersection was blocked by crime scene tape. The Independent Police Review Authority, which handles all police-involved shootings in Chicago, is investigating the incident. The officer has been placed on administrative leave pending the investigation, which is a routine practice.